for Pitcarne; 2nd and 3rd Azure, a chevron between Crescents Argent. Crest, an anchor in pale Azure. 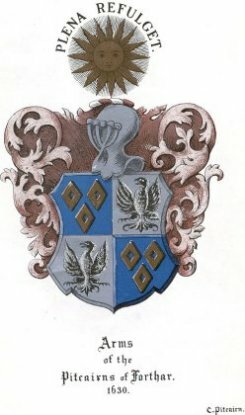 is the coat of arms of the Dury family. The estate of Pitlour is situated near the village of Strathmiglo, and now includes part of the village itself. The village was formerly a portion of the Abbey lands of Balmerino. After Lord Balmerino’s attainder in 1745 this part of the village was acquired by the estate of Pitlour, and now belongs to W.B. Skene, Esq. Pitlour House is about one mile north, overlooking the village. The house is a substantial one, with grounds beautifully laid out, and anciently formed part of the Barony of Strathmiglo, but was sold by Sir James Scott of Balwearie to Henry Pitcarne of that Ilk. It remained with the Pitcairns until the year 1698 or 1699, when the second Patrick Pitcarne of Pitlour, with his father Henry, sold the estate to John Skene of Halyards, who married Patrick Pitcarne’s daughter Helen. The present house was not built until 1748, long after the purchase of the property by Mr Skene. Helen Pitcarne was so fond of her old home that she would not have it altered before her death, and the old house was only pulled down early in last century. The old wall gardens are still untouched: there are some beautiful trees in the park, and the country on all sides is very beautiful. There was formerly a small religious house (or “Hospital”) at Gatesyde, at the village of Edenshed, in the parish of Strathmiglo, probably founded by Robert III or James I. The original matrix of the seal is this house is now in the possession of a gentleman in Kinross. 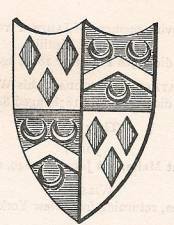 The Pitcairns of Pitlour were descended from John de Petcarne, who in 1250 received a grant of lands of Innernethy from his kinsman, Sir Hugh de Abernethy, from whom were also descended in the direct line the Pitcairns of that Ilk and Forthar. Henry Pitcarne of that Ilk and Forthar-Ramsay was eleventh laird in 1489. He married Egidia, or Grizzell, Marlville or Melville, and had two sons David, who succeeded to Pitcairn and Forthar-Ramsay; and John, his second son, who succeeded to Pitlour, and the Barony of Drongie or Drumgy.